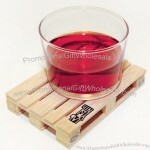 Unique eco-friendly natural wood pallet coaster. Freight and shipping companies love this useful desk accessory. May be pad printed or engraved. Products are not meant for use by kids or pets. They might present a choking hazard to children under 3 years old. Product Size: 3.125" x 3.125"
Print Area: Front, 2.25" x .375"
Size: 3.5" x 3.5" x .375"
Print Area: Front, 2" x 2"
This handsome natural wood coaster adds an old-fashioned touch to the desk top. A slim (.375") slice of actual wood. Looks great with either pad print or engraving. 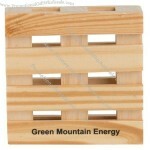 Due to handmade nature with this natural wood product variations in color and size can be expected. Merchandise is not intended for use by kids or pets. They could present a choking hazard to children under 3 yrs . old. Coasters have never been so rugged, design-lead and eco all at once. 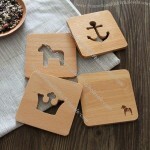 The Pallet-It Coaster Set includes five coasters, each one handmade and designed by Design Studio Labyrinth. The coasters are exact replicas of Euro pallets, downsized to a 1:10 and stain resistant thanks to a barely noticeable matt laquer in-keeping with the rugged pallet feel. Made from real recycled wood the Pallet-It Coasters keep your surfaces protected from hot and cold drinks and looking great. 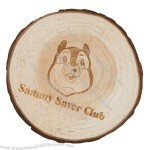 Custom brand your unique promotional giveaway and engage your audience with our promotional wooden eco coasters or one of our other logo printed promo bar supplies products. 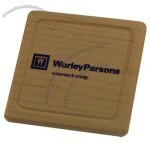 Wooden coasters in either round or square shape can be custom engraved with your logo for a burnt environmentally friendly coaster give away. These fun MDF wooden coasters are environmentally friendly, as MDF is made of wood scraps and is also biodegradable and an all natural product. 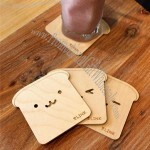 The coasters come at a size of 9cm dia. 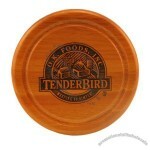 Wooden coasters make a great gift with purchase for Drinks promotions and other lifestyle themed marketing campaigns. 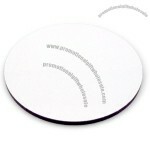 Coasters are also great promo items for events, conventions for around the office or even as a cheap mailout item. Coasters are packed in polybags. An authentic touch for your bar or coffee table! 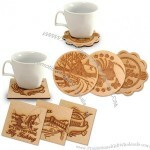 These fantastic Coasters are hand crafted in China and made from the highest quality, stained Jarrah timber. 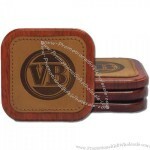 Each coaster features genuine leather and stitched with the your logo, then mounted on top of the quality Jarrah base. 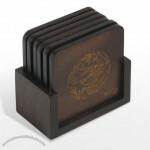 These top quality coasters also have felt backing to protect your bench. Available in a set of 4. Actual Size: 90mm x 90mm. 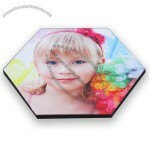 Freely design: To be printed with your favorite pictures. Logo customizable: Company, community or other personal logo can be printed. 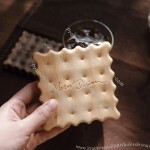 Non-friable: Contrast to ceramic coaster, this coaster will not be broken when dropping. 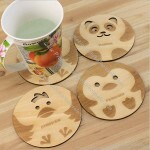 Waterproof & corrosion resistance: Wooden coaster will still keep in good condition with colorful image when liquid spill on. Uncomplicated designs allow your logo to be the focal point. 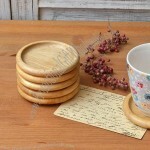 This solid wood coaster is available in five woods or finishes. Worried about moisture or slippage? Don't be! Each coaster receives a super tough conversion varnish finish. 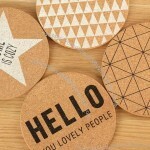 To protect all your delicate surfaces, a cork surface is applied to the back. 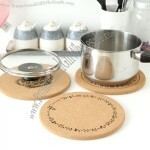 Options include leather or cork inserts laid into a routed pocket on the coaster. The genuine leather is available in black, navy blue, green and burgundy. protect all your delicate surfaces. 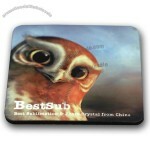 Custom-made Wooden Coaster From China Factory, Low price Wooden Coaster, Top Quality, True wholesale source for original!